You’ve got to feel for the PR team over at Colgate this week. They planned a PR stunt that was altogether too successful and were left retreating with their tails between their legs as a result. 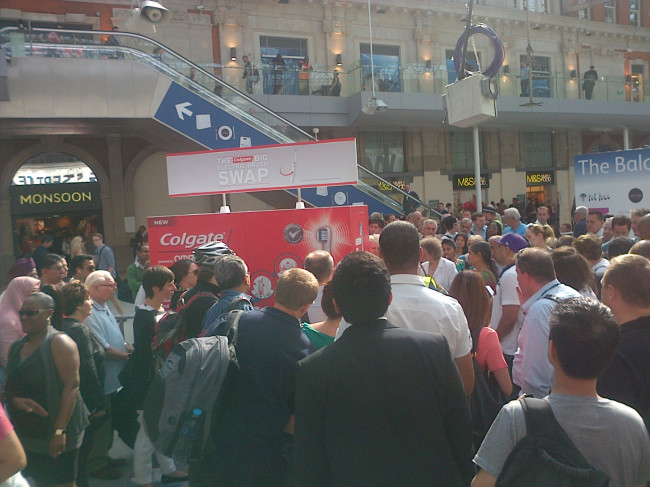 The idea, like most of the best ones, was simple: encourage commuters to bring an old toothbrush to Waterloo station to exchange for a sparkly new one, spread some good feeling amongst potential customers and get 150 people to try out your product (the number 150 was, of course, the first of their problems). Unfortunately, they rather underestimated the numbers and thousands of people showed up to take advantage of a great offer. So what do you do when your PR stunt causes chaos and gets shut down as a result? Take to Twitter of course. Using #BrushSwap the Colgate team tried to explain what had happened and, crucially, apologised right away (something which many brands fail to do until it’s too late). It wasn’t a complete save but it undoubtedly helped salvage what could have turned into quite a reputation-damaging situation.